The Chandra Source Catalog (CSC) , version 1, contains properties for nearly 100,000 point like sources observed by Chandra during its first 8 years. This includes source positions, fluxes, count rates, hardness ratios (colors), extent, and measures of variability in multiple energy bands; all of which are reported for each individual observation as well as merged properties for overlapping datasets. The primary interface to query the source catalog is CSCView a Java-based graphical user interface (GUI). There is also a web based command line interface (CLI) that is available for users who experience problems running the Java application. They also provide access to the catalog data products and can optionally query the CSC Limiting Sensitivity service for upper limits when a source is not detected. 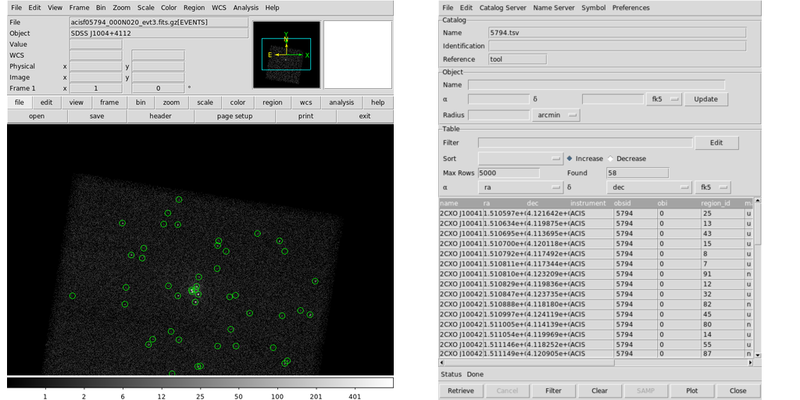 To show how to perform a simple search of the CSC catalog using either a Chandra OBS_ID or a position with radius. Users who require more filtering and sorting capabilities should use the CSCView application. For details on the Chandra Source Catalog, the properties, and data products, users should visit the Chandra Source Catalog web site. Last Update: 16 Dec 2014 - Review for CIAo 4.7. No changes. from the Sload Digitial Sky Survey catalog. We begin our search by simply using the search_csc script and providing the name of the object and a search radius (in the default units of arc-minutes). Since the name has a space it needs to be quoted. The results are printed to the screen. There are 8 sources in the CSC within 1 arcmin of the location SDSS J1004+4112. The script uses the NED name resolver to translate the name into a position. Setting the verbose level to 2 or higher displays the position. The separation between the detected sources and the input coordinates are provided in the sepn (separation) column in the same units at the radius (default is arcmin). Additional source properties can be requested by adding them to the columns parameter. Here we ask, for example, for the source significance [m.significance], the broad band (0.5-7.0 keV) flux [m.flux_aper_b], the location of the source relative to the optical axis [o.theta], and the number of broad band counts [o.cnts_aper_b]. The list of columns is quite extensive and includes all the columns discussed in the CSC pages. The o denotes an "observation" source property, computed from a single OBS_ID and m denotes a "master" source property which is computed from data from all the OBS_IDs a source was detected. When the output file is "none" or left blank, the source properties are only printed to the screen (with verbose >0). We can set the output file and it will save the Tab Separated Value (TSV) format results. Users will notice that some additional columns are also included: obi, region_id, match_type, and instrument. These columns are required by the script and are always included in the results. Also users should be aware that - contrary to what happens when the results are just printed to the screen - the sepn value is always saved in units of arcsec regardless of the radunit value. When the default columns=INDEF is set, many of the most common columns are retrieved and saved to the output file; however, only a few are printed to the screen. We see that there were a total of 35 sources detected in this observation. 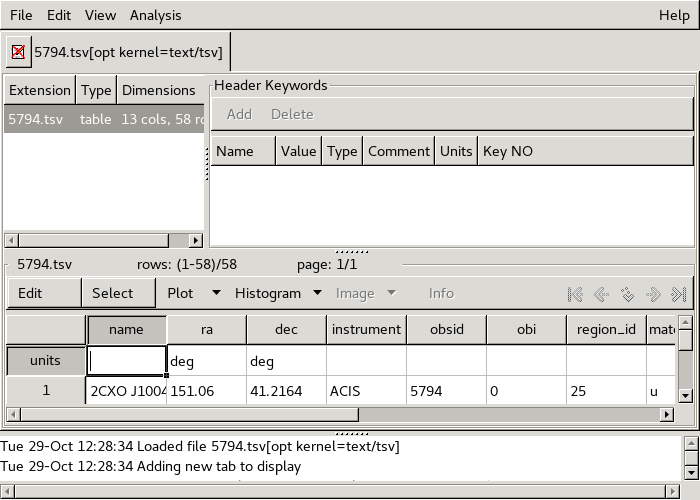 The columns parameter accepts the same inputs as the search_csc script and the screen and file outputs behave the same. The only difference is that there is no sepn column returned: since we are searching by observation there is no distance to compute. 5794      0.2 ACIS-S NONE   81.1 2005-01-01    Inada "SDSS J1004+4112"
We can see that there are 4 other observations that observed our source. Why where these not included in our original search results? Without doing much analysis, the easiest thing to notice is that the dates of the observations are in 2010. Version 1 of the catalog only includes data through 2009. The data products used to create the source properties are also available for each source. This includes both observation level products, like full field event files, exposure maps, and background images, as well as per source products such as PSFs, ARF, RMF, spectra, and light-curves. The search_csc script organizes the files into directories based on the source name, then OBS_ID, and then region number. All the files are returned gzip'ed. Now the directory structure starts with the OBS_ID and with a sub directory for each source. Since the evt file is common to all the sources, it is stored in the OBS_ID directory. Note: by entering 'q' when prompted we quit out of downloading any more data products, so only the files for the first two sources were retrieved. To use the output with CIAO tools you must explicitly specify that the file is in TSV format using the [opt kernel=text/tsv] directive as part of the virtual file syntax. Users can then use the catalog tool to interact with the catalog table and source properties. The data can also be transmitted to other SAMP enabled applications such as TOPCAT. If a source is not detected, but an observation covering that part of the sky is included in the catalog, then an upper limit on the source flux (in photon units) is also available. Users who need to construct more complicated queries (eg variable sources with some range of hardness ratios etc.) or who need to perform cross matches, must use the CSCView application or use the CSCCLI interface directly. Research that makes use of the data in the catalog should site Evans et al 2010, ApJS 189, 37. 25 Jul 2013 Initial version. 25 Nov 2013 Review for CIAO 4.6. No changes. 16 Dec 2014 Review for CIAo 4.7. No changes.